Colourful Easter eggs are not only fun to make, especially if you involve your children, they also add to your home decor and Easter decorating nicely. Using them to place around a bowl of fresh flowers or placing pretty Easter egg on each dinner plate will make your festive decorating easy. You can get very creative colouring your easter eggs. Some techniques are more complicated than others – but there really are very simple and easy ways to create a nice selection of colourful eggs. Here are few techniques, complete with instructions, that I hope will be helpful to you. If you print this article, it’ll make it easy to have it with you while you make your Easter eggs with your kids. 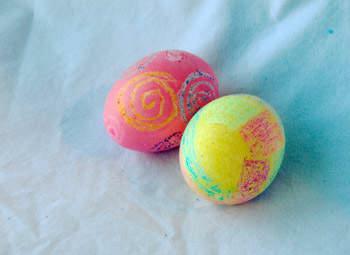 We’ll be creating 3 types of effects: marble, crayon and sponge styles of Easter eggs. I’ve also created a list of Easter egg decorating tips that I’ve picked up over the years at the end of the article, if you’ve got any more tips then please leave me a note in the comments! Use crayons to draw designs on the egg. Have kids hold the egg gently so they do not crack the shell. This step is optional but adds a fun effect. If you like, mix 1 Tbsp of white vinegar into a coffee mug of water (filled ¾ full) then add several drops of food coloring. Dip the crayon coloured egg into the dye and let sit for about a minute. Remove and let dry. The dye makes the crayon look brighter, especially if you use neon food colouring! Soak a household sponge in water, then ring it out completely. Cut the sponge into several different pieces, enough so that you have one for each color. Using a paper plate as a palette, squeeze out small amounts of several different colors of paint. Place an empty egg carton upside down so that you can rest your eggs on it to dry once painted. Hold an egg in your fingers, and with your other hand, dab a sponge into desired paint color. Dab the sponge onto a piece of paper towel. The object is to remove the excess paint, but not completely dry it out. Now dab the sponge directly onto your egg, using any type of random pattern you like. Paint as much of the egg as you can and place it down to dry. Repeat steps four to six for each egg, using different colors. For a coloured background with white sponge marks, simply paint the egg a solid color with a paint brush or with one of your sponges. When dry, sponge on a pattern with white paint. When one side has dried, complete the other side and allow that to dry as well. Place eggs into an egg holder, or fill a bowl with Easter grass and arrange the eggs atop the grass. To make pastel paints from primary colors, simply add enough white paint until you have reached the shade you want. Use a pair of scissors to round the edge of the sponges. Square edge can make your design look choppy, whereas a rounded edge looks softer. 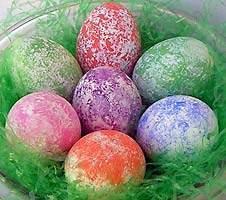 Instead of painting the eggs a solid color, you can always dye them with traditional methods, then sponge paint them with white. This is an easy alternative if you don’t have several different paint colors on hand. Get creative! Make different shapes by cutting hearts or letters from the sponges. Dollar stores will sometimes have shaped sponges in the kid’s bath section. To boil perfect eggs, place into a shallow pan, cover with water and boil gently for three minutes. Turn off heat and cover pan with a tight fitting lid and let sit for 15 minutes. Place pan in sink, carefully drain out hot water and let cold water run over them for several minutes. Turn off water and add several ice cubes and let sit for about 5 minutes more. Try different types of food colouring, and for sure – try neon colors! 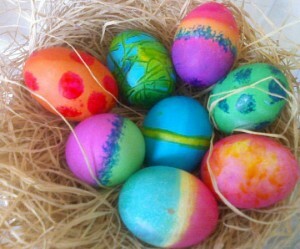 I hope you enjoy colouring eggs with your children, these days go by quickly! Please send in your comments, suggestions and pictures to share with the rest of us Moms and Grandmoms!